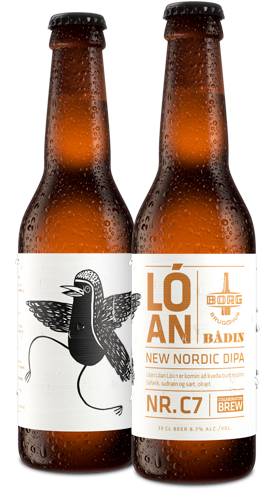 Lóan arrived early in the spring of 2017, touching down in Iceland on the National Beer Day, March 1. This dry-hopped Double IPA was brewed in collaboration with Norwegian brewery Bådin, using Mosaic, El Dorado and Galaxy hops. Lóan has a full-bodied yet gentle taste. She doesn't tend to hang around for long and so is best enjoyed while still fresh. Illustration by artist Sunna Ben.